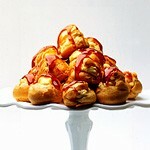 Choux pastry is the lightest, crispiest, airiest pastry, which can be used to make profiteroles, éclairs or savoury gougères. It puffs up in the oven until it is eventually set by the heat. 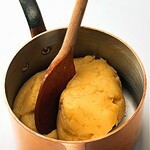 The airiness, in fact, is caused because choux has a high water content, which is turned into steam during baking and this forces the pastry shell outwards and gives it volume. What is really good about choux is that it doesn't call for any particular pastry skills, like lightness of hand or careful rolling. I never pipe choux because I am convinced that a freshly baked golden profiterole looks so much crustier if it is spooned, rather than piped, on to a baking sheet. To make about 30 choux buns you will need 2½ oz (60 g) of strong plain flour, which, with its higher gluten content, gives crisper results than ordinary soft, plain flour. As you are going to need to 'shoot' it quickly into the water and melted butter, fold a sheet of silicon paper (baking parchment) to make a crease and then open it up again. 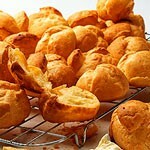 Sift the flour straight on to the square of paper and add a teaspoon of caster sugar if you are making sweet choux, otherwise use a seasoning of salt and pepper. Next, put 5 fl oz (150 ml) of cold water in a medium-sized saucepan together with 2 oz (50 g) of butter, cut into small pieces, then place the saucepan over a moderate heat and stir with a wooden spoon. 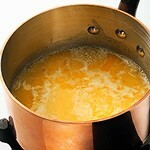 As soon as the butter has melted and the mixture comes up to the boil, turn off the heat immediately, as too much boiling will evaporate some of the water. 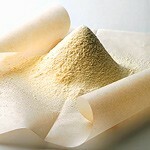 Then tip the flour in – all in one go – with one hand, while you beat the mixture vigorously with the other. 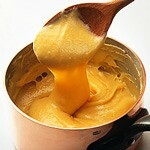 You can do this with a wooden spoon, though an electric hand whisk will save you lots of energy. Beat until you have a smooth ball of paste that has left the sides of the saucepan clean – this will probably take less than a minute. 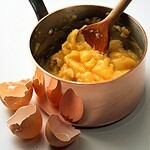 Next beat 2 large eggs well, then beat them into the mixture – a little at a time, mixing each addition in thoroughly before adding the next. Beat until you have a smooth glossy paste. At this stage, lightly grease a baking sheet then hold it under cold running water for a few seconds, and tap it sharply to get rid of excess moisture. 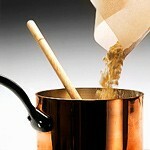 This will help create a steamier atmosphere, which, in turn, helps the pastry to rise. 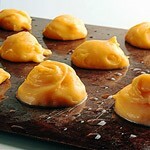 To make the choux buns, place teaspoons of the mixture on the baking sheet, leaving 1 inch (2.5 cm) between them, then bake on a high shelf in a pre-heated oven – gas mark 6, 400°F (200°C) – for 10 minutes. After that, increase the heat to gas mark 7, 425°F (220°C), and bake for a further 15-20 minutes until the buns are crisp, light and a rich golden colour. Pierce the side of each one to let out the steam, then cool them on a wire rack.